Protecting the Sanctity of Marriage via Billboard. Classy! 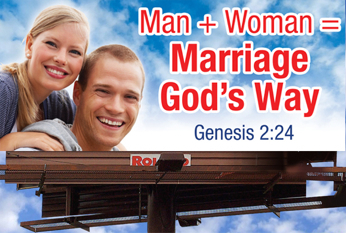 Gay blogs are reporting a billboard in Putnam County, Tennessee is being hailed by anti-gay group, The National Organization For Marriage, for…um…reminding everyone that the Bible says something or other about marriage being for straight people? We think? To reiterate for the gajillionth time, gay people are not asking for permission to wed one another in bigoted Christian churches that espouse hate under veiled pretenses of loving thy neighbor and asking What Would Jesus Do. We are fighting for CIVIL MARRIAGE and our right to be treated as equal citizens under the laws afforded to all Americans. Billboards such as these are simply a Photoshop nightmare and a waste of good cash. We have no interest in your Kool Aid. We’ve got blueberry vodka sodas over here. And free cover.